Securatape is normally available for dispatch within 2-3 working days, in three off the shelf versions as pictured. Roll size is 50 metres long x 50mm wide on a standard 76mm core with optional perforations every 152.4mm. Sold in boxes of 20 rolls, it is suitable for sealing carboard boxes, cartons, jiffy bags, envelopes and even plastic bags. Not suitable for re-usable items. Blue tamper evident security tape, 50 metres x 50mm with overt printed 'security' message and high visibility void message revealed when tape is removed. 1 box=20 rolls @ £13.50 per roll excl VAT. Also available with optional perforations every 152.4mm. Red tamper evident security tape, 50 metres x 50mm with overt printed 'security' message and high visibility void message revealed when tape is removed. Plain Brown tamper evident security tape, 50 metres x 50mm with void/opened message revealed when tape is removed. 1 box=24 rolls @ £13.00 per roll excl VAT. Also available with optional perforations & sequential numbering every 152.4mm ( box of 20 rolls) @ £14.00 per roll excl VAT. 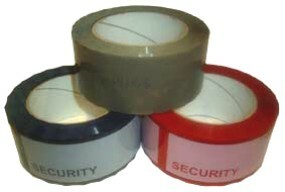 High Security, tamper evident security tape, 50 metres x 50mm with overt printed 'security seal' message, sub surface sequential numbering and perforations every 152.4mm. High visibility void message revealed when tape is removed. 1 box=20 rolls @ £18.00 per roll excl VAT. Need to buy a smaller quantity ? Check out our specials page.